Be the first to share your favorite memory, photo or story of Ashlyn . This memorial page is dedicated for family, friends and future generations to celebrate the life of their loved one. Ashlyn Rayanne Ellis, of St. James, MO passed away Sunday, March 17, 2019 at the age of 14. She was born on September 8, 2004 in Jefferson City, MO to Johnny V.E. Ellis and Tracy (Doria) Ellis. Ashlyn was preceded in death by her father, Johnny Ellis and a cousin, Tristan Ellis. Ashlyn will be sadly missed by her surviving family which includes: mother, Tracy Ellis of St. James, MO; one brother, Conor Ellis and one sister, Kamryn Ellis, both of St. James, MO; grandparents, David and Bonnie Doria of Drury, MO and John and Janet Ellis of St. James, MO and extended family and friends. A funeral service for Ashlyn R. Ellis will be conducted at 11 a.m. on Friday, March 22, 2019 at the Null and Son Funeral Home in Rolla. A visitation for family and friends will be held from 6-8 p.m. on Thursday, March 21 at the funeral home. 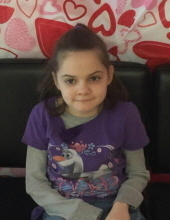 Memorial contributions are suggested to Ashlyn’s family to help with final expenses. To send flowers or a remembrance gift to the family of Ashlyn Rayanne Ellis, please visit our Tribute Store. "Email Address" would like to share the life celebration of Ashlyn Rayanne Ellis. Click on the "link" to go to share a favorite memory or leave a condolence message for the family.